Sweating during physical activity or heat can cause severe problems due to dehydration and electrolyte loss. Electrolytes, the salts your body needs for proper functioning, include sodium, chloride and potassium. Without the proper balance of electrolytes and fluids, you can experience muscle cramps, nausea, vomiting, coma and even death. Gatorade helps replace fluid and electrolyte loss. The sodium in Gatorade not only helps maintain proper blood volume, but it also acts as a preservative. When you sweat during exercise, you lose sodium, about 900 to 1400 mg of sodium per liter of sweat. This can be problematic, as sodium helps maintain adequate blood pressure and volume. Although health experts often talk about the dangers of high sodium intake, low sodium levels, also known as hyponatremia, can be just as dangerous. Gatorade contains about 450 mg of sodium per liter, or about 110 mg per cup. Drinking one liter of Gatorade will replace the sodium lost in approximately half of a liter of sweat. Drinking sodium and other salt-containing fluids triggers your body to increase its water intake, similar to eating a salty meal and feeling very thirsty afterward. To rapidly replenish fluids lost during exercise, due to sweating, the sodium and other salts in Gatorade, promote rapid rehydration by making your body feel very thirsty, encouraging continued fluid consumption. According to Gatorade, unlike water, caffeinated or diet beverages, the sodium in Gatorade helps maintain body fluids without promoting water loss through increased urination. Gatorade contains two types of sodium: sodium citrate and sodium chloride. Sodium citrate regulates tartness but represents only a small fraction, about 1 percent, of the overall volume. Most of the sodium in Gatorade comes from sodium chloride, or table salt. Sodium chloride provides both sodium and chloride, two of the three major electrolytes that Gatorade targets for replacement; potassium is the third. While sodium chloride in Gatorade provides essential fluid and electrolyte replenishment, it also acts as a preservative. Most bacteria live in environments where the concentration of water outside the cell is greater than the concentration of water inside the cell. When the outside environment around a bacterial cell is salty, water inside the cell will tend to move outside through the process of osmosis. This causes the bacterial cells to dehydrate and die. Therefore, high levels of sodium help prevent the growth of microorganisms in Gatorade. Gatorade contains twice the amount of sodium as other sports drinks, such as Powerade and Allsport Sports Drinks which each contain 55 mg of sodium per cup. Regular and diet sodas typically contain about 50 to 60 mg of sodium per cup. Coffee contains about 5 mg of sodium per cup and water contains about 2 mg of sodium per cup depending on the source of that water. The amount of sodium in milk varies depending upon the type of milk; non-fat or skim milk contains about 130 mg per cup, while buttermilk contains about 260 mg of sodium per cup. Tomato and other vegetable juices can contain upwards of 650 mg to 675 mg of sodium per cup. 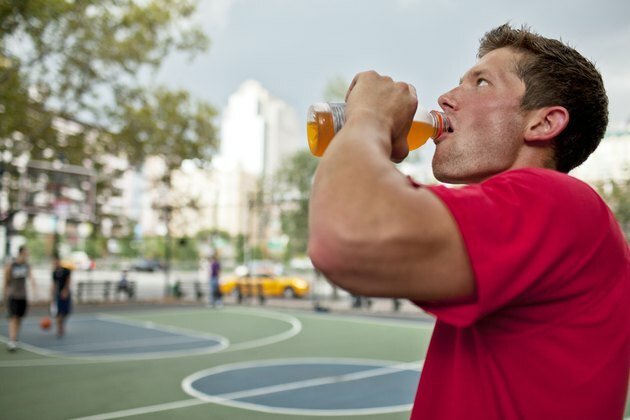 Vanderbilt.edu: Sports Drinks, Are They Effective in Improving Athletic Performance?